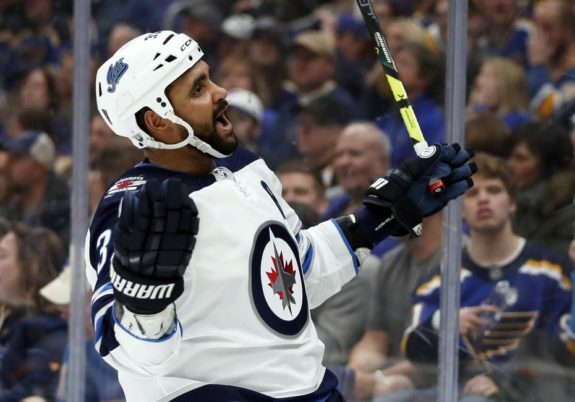 The first period of Game 3 between the Winnipeg Jets and the St. Louis Blues looked eerily akin to the six periods preceding it, with the Jets getting big chances but getting stymied by Jordan Binnington and the Blues scoring a timely goal after weathering a Jets’ surge. Indeed, two huge saves in particular by the Blues’ rookie phenom — a goal line toe save on a Bryan Little slot shot and a spectacular stick-shaft save on Mathieu Perreault — must have had the Jets wondering whether they had to give up an arm, a leg, or perhaps a firstborn child in exchange for getting a puck into the back of the net. Through 20, it looked as though goaltending — a big reason the Blues skated away with a pair of one-goal victories in Games 1 and 2 — could once again be the difference in Game 3 and put the Jets in a 3-0 hole. But that all changed with a fluky floater. After not converting a number of ten-bell chances, it was a harmless-looking point shot — a shot thrown indiscriminately toward the net by Kevin Hayes that deflected off Alex Pietrangelo — that finally got behind Binnington. It was a perfect example of the old cliche “put pucks to the net and good things will happen” ringing true. The goal energized the Jets and seemed to confirm to them Binnington was human after all. They kept pushing and playing a fast, high-tempo game. While they didn’t reap any rewards from that play style in the first, they certainly did in the second after breaking through for the tying goal. Shortly after a big scrum resulted in some four-on-four action, Jacob Trouba found Patrik Laine all alone in front, and the winger netted his third goal in as many games with a slick, in-tight move. Then the Jets, really flying by this point, notched their third goal in a 4:01 span when Kyle Connor ripped one top shelf on a four-on-three power play. The goals were well-deserved based on possession numbers — the Corsi For Percentage favoured the Jets 67-33 through both periods. Connor spoke understatedly when describing the impact of his goal and the three-tally second on the Jets’ collective psyche, cooly describing the outburst as just a matter of time. 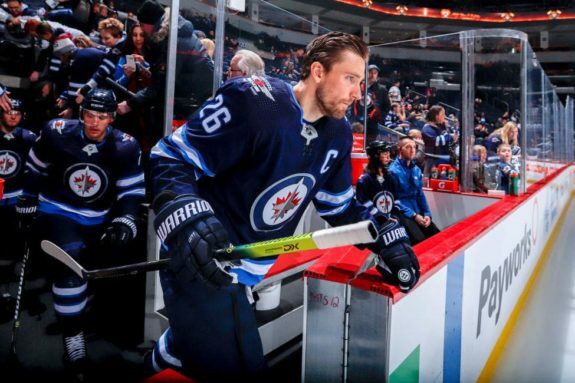 Connor’s sentiment was shared by Blake Wheeler Jets post-game — that they knew if they kept generating chances, they’d eventually find twine. Even up 3-1 after two, a visitors’ victory was far from a foregone conclusion. The Jets had a penchant for blowing third period leads in the regular season — losing nine times when leading after two — and lost Game 1 in the same fashion. It appeared history might repeat itself in Game 3 as Wheeler was sent off for slashing and Vladimir Tarasenko scored on the ensuing power play to cut the Jets’ lead in half just 1:51 in. On this night, however, the Jets kept pressing, pushing, and grinding, knowing only four teams in NHL history have come back from a 3-0 series deficit. 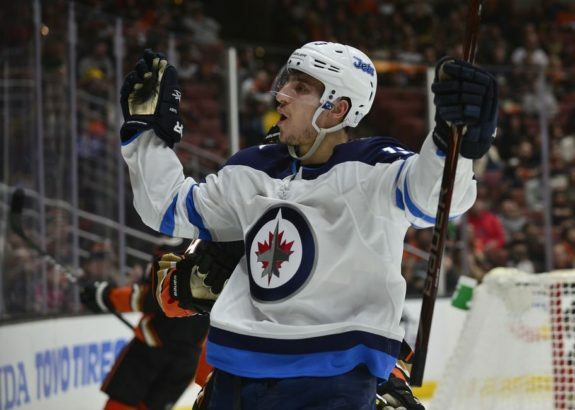 Brandon Tanev responded with his first goal of the playoffs less than three minutes later. A similar scene played out later in the third. After the Blues cut a 5-2 Jets lead to 5-3 at 13:42, Kyle Connor scored his second of the game just 1:02 after, taking the air out of the Enterprise Centre and cementing his team’s first victory of the postseason. “They played like a desperate team,” TSN’s Darren Dreger said post-game. “We talked about the need for ‘big boy’ hockey where everyone needed to step up regardless of where you were slotted in that lineup… it was all hands on deck. Let’s now see if they can carry some of that momentum and even the series in Game 4,” he continued. The Jets’ three third-period goals came on just four shots. 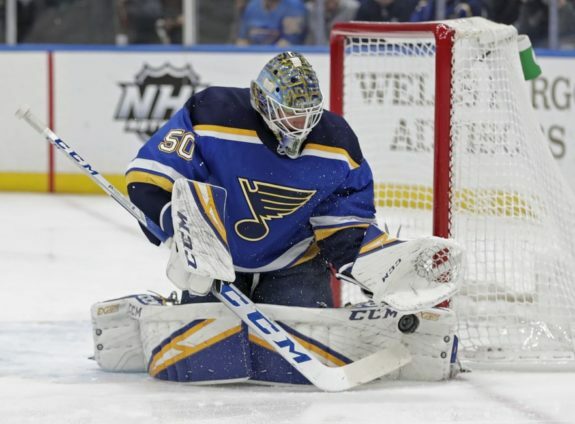 Almost unbelievably, it was the the first time Binnington ever allowed more than four goals in his combined 33 starts between the regular season and playoffs, a stat testament to just how tough he’s been to beat and how key he’s been in the Blues’ surge from the cellar to the playoffs. Despite the win, the Jets are still down 2-1 in the series and face another important test on Tuesday. Even if they fire on all cylinders like they did in Game 3, there’s no guarantee they’ll be rewarded again — Binnington could steal the show like he’s done so many times already this season. However, there’s also the possibility the six-goal game rattles the young net minder and the Jets find similar scoring success. If the Jets come out in Game 4 and play the desperate game they did in Game 3 but get “Binningtoned,” that’s one thing. However, their chances of knotting the series two games apiece will be a lot higher if they stick to their gameplan and work as hard as they did Sunday night.